Here is the points table of the ‘Summer Series GP ‘ 2011. The Royal National Lifeboat Institution’s (RNLI) popular Summer Series is coming to South Tyneside this summer with runners urged to show their support for the charity which saves lives at sea. 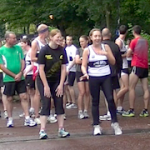 21st June 2011 In ideal racing conditions, 30 runners took part in the third race of the club’s new race series, including a couple of runners sampling the club for the first time. Club captain Paul Hilton sends in this reminder. This Tuesday evening (21st June) is the 3rd in our Jesmond Dene “Summer Series” GP.